Lords of Black is doing this week six concerts in Germany, The Netherlands and Belgium. After two shows in Germany (Aschaffenburg and Ludwigsburg), they landed in The Netherlands for two gigs (Landgraaf and Rotterdam) before finishing this short tour in Belgium (Vosselaar) and again Germany (Augsburg). 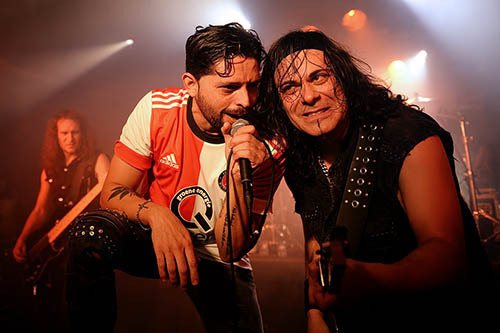 We went to see Ronnie and his Spanish band mates in Rotterdam where they were the headliner of the small Rotterdam Rocks festival. In the cozy but not too crowded Baroeg Dutch rockers Rebelstar and Picture were the first two of four bands. Especially Picture got the crowd going. Voodoo Circle with guitar slinger Alex Beyrodt is co-headlining these six tour dates with Lords of Black. They were next. They gave a fine performance despite some technical problems. Classic hardrock, clearly influenced by bands like Rainbow, Whitesnake, Deep Purple and Led Zeppelin. 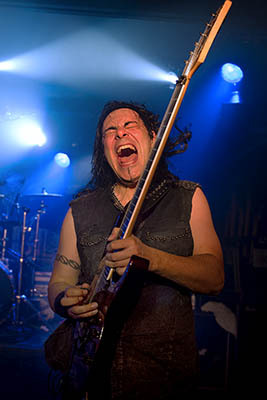 Alex is an excellent guitar player, vocalist Herbie Langhans a fine frontman who impressed with his vocals while with Matt Sinner on bass & vocals they have another hardrock ace in the band. All in all they gave a great show and the audience enjoyed every minute of it. 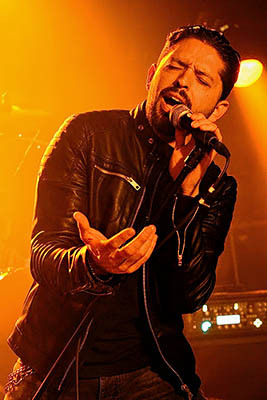 Lords of Black ofcourse got known by many Rainbow fans because singer Ronnie Romero is also the present frontman of Ritchie Blackmore's Rainbow. The Spanish power metal band have done since last years European Tour several shows all over the world. With another bass player but a setlist (except for the encores) that was the same as on their last visit to The Netherlands they gave a solid performance. Ronnie excelled, very confident he lead the Lords with the great axeman Tony Hernando and powerhouse drummer Andy C through their performance. Lords of Black is a lot heavier than Rainbow, much more groovy metal. That's probably why not too many Rainbow fans did not come to their shows. That's a pity because this band deserved a bigger audience. Besides that Voodoo Circle would have pleased those fans tonight. Full of power and energy Lords of Black went on full steam through a fine selection of songs of their two albums in Rotterdam. With songs like 'Nothing Left to Fear', 'Everything You're Not', 'Cry No More' and 'Shadows of War' to name a few they convinced the fans again. In the encore it was time for some classic Dio era tracks. 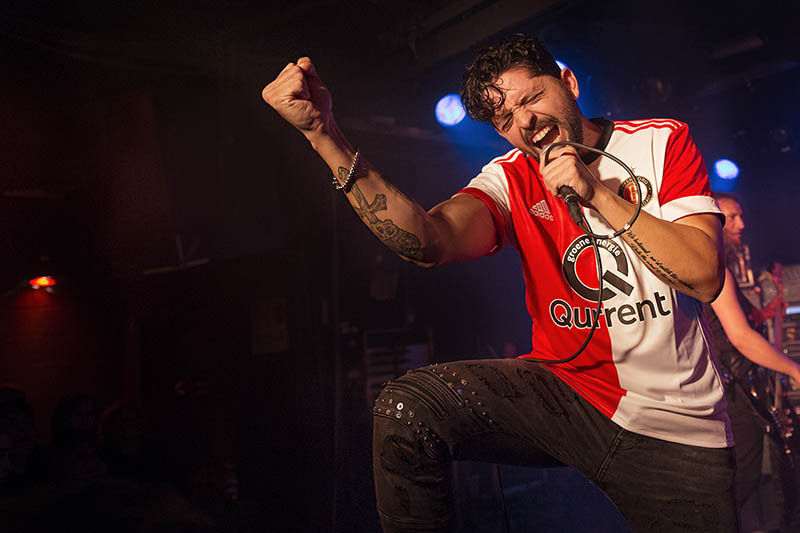 They returned on stage, with Ronnie wearing a shirt of local soccer club Feyenoord, to get the audience going wild with great versions of 'Stand Up and Shout' and 'Kill the King'. After the show we spoke briefly with Ronnie. He enjoyed tonight's gig. He told he thinks the Japan tour for Ritchie Blackmore's Rainbow that is rumoured in the press is not likely. He thinks there are more chances that there will be some dates in Europe again, like in Germany and/or the UK. In the mean time Ronnie will be also busy with other projects like a tour with Argentinian guitar player Walter Giardino and a new album with Lords of Black that is expected next year.